Argos have such a huge range of Chad Valley toys available, the hard part can be choosing something! I have a 5 year old daughter who sometimes can lack some imagination, therefore finding something that can engage her is key to happy playtime. 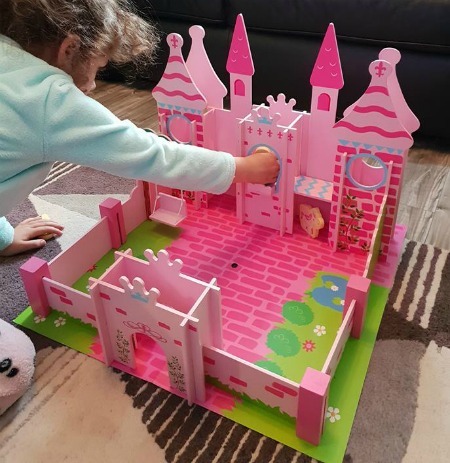 Having worked with Argos on their Chad Valley Play Panel, we have been recieving some parcels filled with toys that the experts think Emma would love, so I would love to share with you the recent successes that we are loving. First up, the Chad Valley Wood Shed Fairy Castle. This item is not something I ever would of considered buying as I am limited on space in my house and it looks huge. But when I actually tested it out, I found out that it all flat packs away, brilliant! Emptying the box the first time, it looked daunting, but it has clear instructions and it literally took me a minute or so to slot it all in. There is no screws or glue needed, the wooden pieces just slot together which I love. 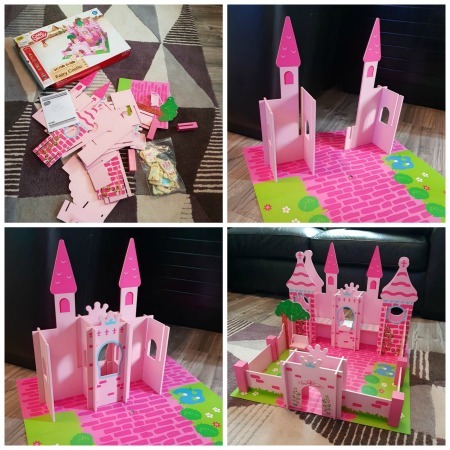 Once assembled you have an impressive sized pink castle, with turrets, fence and plenty of space to hide the characters. The characters that come with the set include two fairies (we have added some sticky blu tac to make these stick to the tree and castle…as my 5 year old is adamant that fairies need to fly) a queen, a king, 2 princesses and a prince and the icing on the cake is the UNICORN! We have had many role play games with the characters and even play hide and seek with them in the castle. I can’t believe how much fun my daughter has had out of static wooden figures, it’s really helped her imagination. Another firm favourite is the colour in Chad Valley Be U 1000 piece sparkle box. 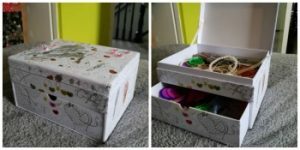 This box looks a bit deary at first glance as it comes in white with black outline design, but don’t let that put you off, it’s great because it’s a blank canvas for the child to decorate and really make their own. 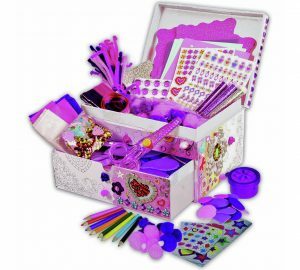 It comes with loads of craft items inside, pom poms, glue, jewels, stickers, scissors, tissue paper and so much more. My daughter is only 5, so the fiddly bits are not perfect, but you know what? She adores this box so much, every time I pop to Primark she picks some special jewels to add to her collection, which are all stored in here. This set is £12.99, but is on an awesome deal Argos do, which is any 2 toys for £15 from a huge range and this is one of them. This would definitley appeal for older children too, my 13 year old would of had a field day decorating this too if she had got her hands on it before Emma did. Now I have something super exciting for you! Here is your chance to win a £75 Argos voucher, which means you can buy something great from the Chad Valley range for your own family to enjoy. I’d put it towards a new bike for my daughter. She is asking for one for her birthday in July. I think the kids would like a trampoline. So I would use the voucher to by one of these. I would buy some presents for my girls birthday. I would buy my daughter a Dolls House. I would buy a surprise treat to keep my little ones amused during the next half term break! I would buy something for then grandchildren. I’d spend it on toys for my young nephew’s forthcoming 3rd birthday. Chad Valley – Kids Junior Indoor Trampoline – Green and Blue, and Chad Valley Supermarket Cash Register and Chad Valley – Double Sided Easel because they are all on my little boys wishlist, We would have a wonderful time with these. I’d buy some outdoor toys with the voucher. I would get some aftershave. My grandaughter will be three next month, so three guesses lol ! I would get some new kitchen items and summer toys for the little ones! It’s my granddaughters birthday in May, so would love to buy her the 3 story glamour mansion, she’s wanted one for ages now and it would be a fantastic surprise for her. I would buy a Lovely Chad Valley play table ! I’d buy my new baby some cot bedding. I’d buy the Chad Valley Airport Playset, the Chad Valley Driftstone Carpark with Cars and the Chad Valley Double Sided Playmat and Cars for my nephew. Thanks. I’d spend it on Lego for my boys – my boys birthday in July and they both love it! I would get a balance bike for my niece. I would get the Chad Valley Tractor And Trailer Ride On for my grandson that is tractor mad at the moment. It’s my daughter’s birthday in June so I would spend it on a Barbie and ds game she wants. Id spend it on bday prezzies for my niece and nephews. It probably would end up being spent on some Chad Valley toys for the kids as that is usually what I end up spending my money on. Would like a smart speaker for myself thought. I would spend it on my daughter, her birthday is coming up soon! My kids would like a trampoline! I’d buy some chad valley garden toys for the summer! Two grandchildren’s birthdays coming up, they love browsing through the catalogue, no doubt they’ll spend it several times! I would buy a new kettle. I know our Estelle would love the Tiny Treasures doll so one of them! I’d spend it on a new hoover as mine is caput! I would treat the kids to a new paddling pool, and I need a new saute pan! I love the dolls house but I’d let my daughter in law choose as she would know best what my grandchildren would like! i’d treat my niece to a new doll! I would buy some ornaments for the garden to spruce it up ready for Summer. I’d buy as much lego as possible. I’d put it towards an Ipad. Thanks for this, I think I would treat my kids to the Chad Valley 3ft Snooker/Pool Game Table. I would spend it on my handsome nephew for his birthday. I would treat my Grandson some new Lego. Id love to get some outdoor toys! It’s awfully boring but I would buy a new kitchen bin. I’m sick of the lids breaking so I want a brabantia as hopefully that will last! I’d buy a new camera so we can take photos of the family. I would spend the money on some garden toys for my little one. Oh this would be so useful for up coming GrandChildrens Birthdays..because When computers crash and batteries are gone, The fun from Chad Valley goes on and on. My poor Kindle Fire is slowly reaching the great tablet-land in the sky. It needs to retire. So I would use the lovely prize on another one. Some of the dolls for my daughter! I would get some bigger garden toys for my godchildren to play with. I could really do with some more storage for my son’s bedroom, so I would probably get a cute kids storage box or unit with the money. And I’m guessing I would also end up getting more toys to put in it too! Part pay for a bike. My daughter loves designafriend so I would spend it on that. I’d use this towards a new vacuum cleaner; mine just died a death about a week ago and I’d love to replace it with the help of these vouchers. We havent got enough beds in our home at the moment so Id put this towards a mattress if I was lucky enough to win! I would buy a Chad Valley kitchen for my daughter. She would love this. Great giveaway. I would keep hold of it and put it towards Christmas, so eventually toys. I would put it towards a buggy for our baby, due September! I’d love to treat my son to a slide for summer. Has to be spent on the kids! LOL Surprise and LEGO! I’d probably buy toys for my little boy. I’d give it to my best friend who is expecting! I would use it for my sons birthday which is soon. A gas BBQ for our garden – Let’s hope we get some decent weather! Would go on our daughters b’day. Love the castle! We now have a garden…would love to get the kids some summer toys. I’d spend it on the chad valley trampoline. I’d buy some outdoor toys & games.